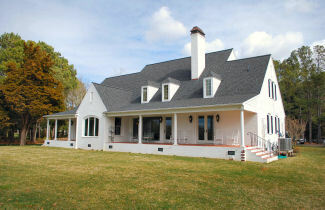 Standing proudly on a high knoll overlooking a broad expanse of rippling blue saltwaters on the Eastern Shore of Virginia is this like-new William E. Poole designed home. 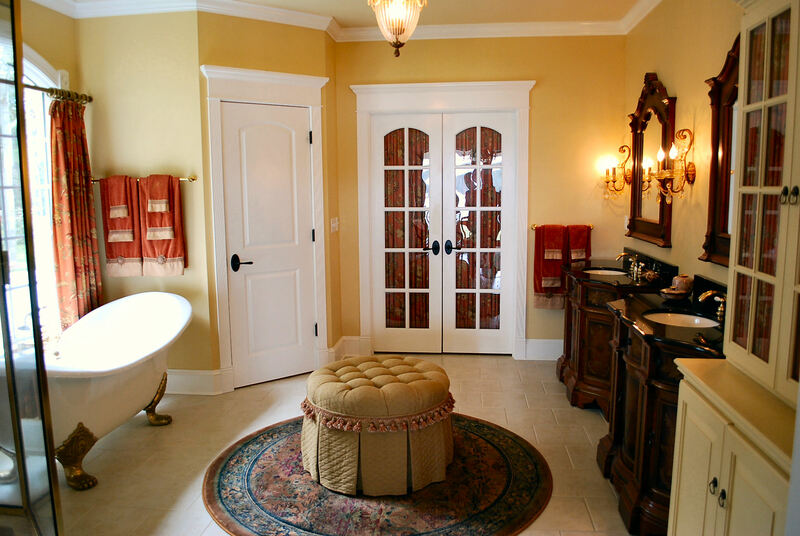 Poole, an internationally famous Southern architect based in Wilmington, S.C. , is especially known for creating comfortable homes featuring warm and romantic living environments. 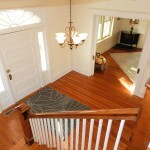 That talent is evident throughout this elegant Chesapeake Bay area like-new brick home of about 4700 sq. ft. for sale. Inspired by French Provincial Revival traditions yet designed for today’s conveniences, the house is positioned to fit perfectly into the site. One of about 20 homes in a tiny neighborhood of upscale waterfront homes near Franktown, VA and shielded from the little winding roadway by a stand of mature trees, as you drive up the house seems to be peeking out, wanting to see what’s going on. The approach to the entrance from the circular drive is across a patterned brick walkway to an entrance portico and an impressive solid mahogany circle top front door. 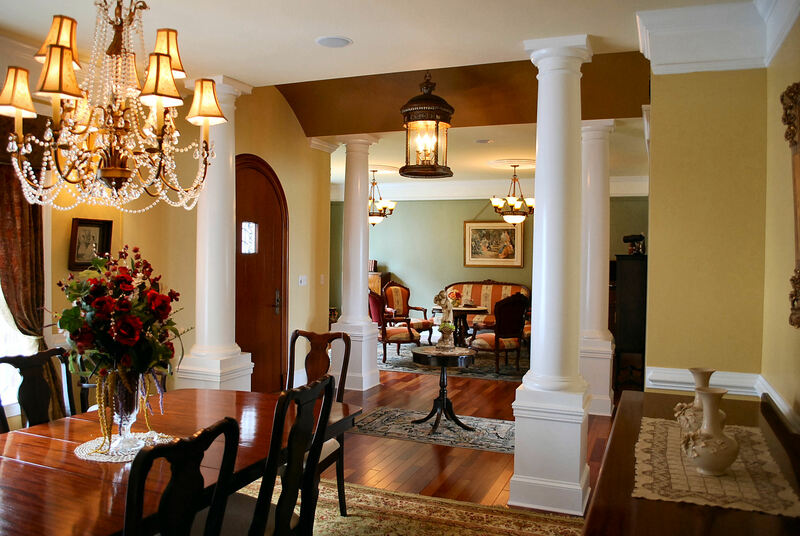 Once inside the spacious foyer, which features an elaborate barrel style vaulted ceiling and entry columns, one’s eye is immediately drawn to the gorgeous water views from the great room beyond. 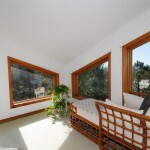 Great pains have been taken to connect the interior spaces to the natural beauty of the outdoors. A bold picture window, flanked by tall doors on either side, is the dramatic focal point of the great room, presenting as it does the mesmerizing vistas of the broad blue inlet beyond. 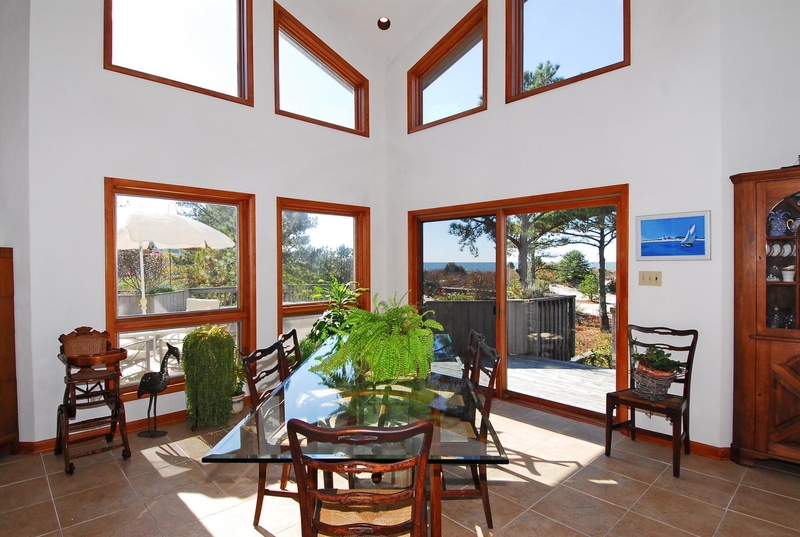 Given the very desirable southwest exposure of this home, sunsets seen through that wide expanse of glass are absolutely spectacular. ( A very important feature for those who, like moi, are not always in, shall we say, top form at sunrise but who really love a great sunset.) 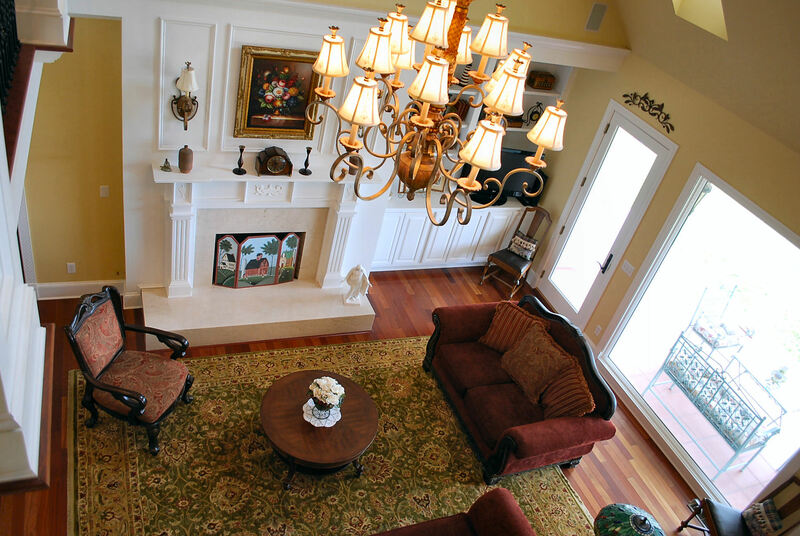 Another focal point in the great room is the sunstantial fireplace with marble hearth and surround, elaborate mantel with dentil molding and frieze plus raised panel overmantel. Outside, a covered tiled veranda, the epitomy of relaxation, runs the most of the length of the entire house and is the perfect place to enjoy a light lunch or savor a refreshing glass of Chardonnay on a breezy summer’s day. 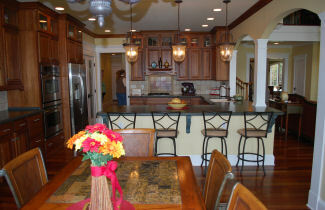 This Chef’s Kitchen will inspire gourmet creations. Divided from the great room and morning room by partial walls with archways and fluted pilasters, the chef’s kitchen is central to everything, the soul of the house. Custom cherry cabinets, honed counters, also sculpted around the sink, custom tile, decorative tile backsplash behind gas cooktop, double ovens, extra deep storage drawers, oversized Lazy Susan corner cabinet and large pantry with frosted glass doors are just a few of the features which make this a superlative place to whip up everything from a simple coddled egg to an elaborate 6 course meal. The adjacent, quite spacious dining room features a lovely chandelier with embossed silk shades and elaborate ceiling medallion, a beautiful room in which to enjoy entertaining friends and family. 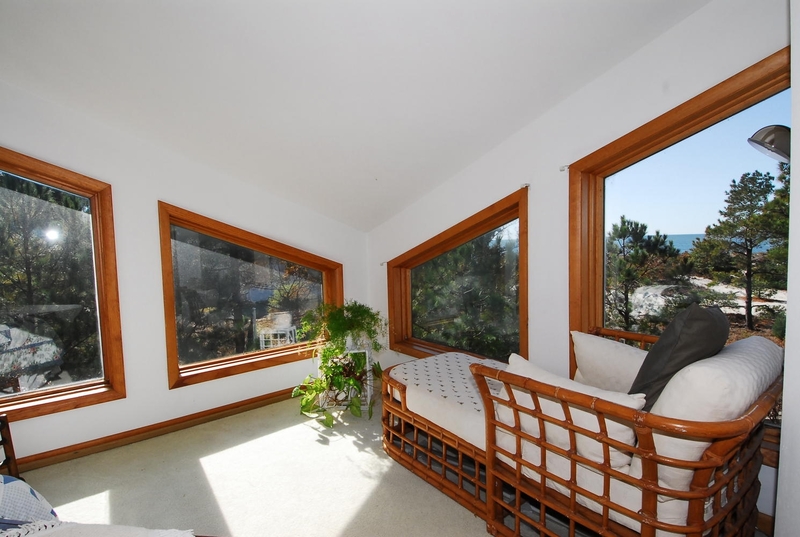 The first thing you notice when entering the master suite is the stunning waterview through the glass side panels and French doors which also combine to allow lots of natural light to flow into the room, giving it a bright and airy feel. And the private tiled covered veranda off the master bedroom offers a secluded nook for relaxing outdoors away from any activities in other areas of the house. 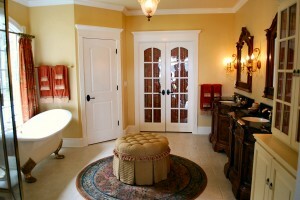 But the piece’ de resistance is the master bath suite. Featuring two separate colorful bombe style dressers as sink vanities, a roomy claw foot tub, large glass shower and a super-sized walk-in closet with large dresser organizer and beaucoup space for shoes and clothes plus plenty of linen storage space, this bathroom is dressed to the nines ! But, mea culpa, I digress. My original point being that the actual planning of one’s vacation is a necessary task, but one that brings a lot of pleasure. Deciding where to go is certainly the first step and deciding what house to pick is great fun. 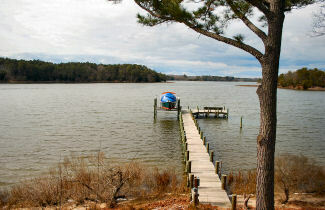 I want to give a shout out to the Eastern Shore of Virginia as a great vacation place and to Blue Heron Realty Co’s vacation rental homes as the cream of the crop ( Review them at www.blueheronva.com/vacation_rentals/ ) depending, of course, on the desired atmosphere. If one is looking for bright lights, loud music, thousands of people on the beach,salt water taffy and souvenir shops every step of the way, Virginia’s Eastern Shore is not the place. 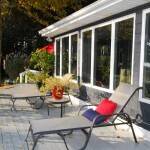 On the other hand, if what you’re longing for is a place for total relaxation in a low-key coastal area, with plenty to do if you want to but if you feel like just hanging around the front porch, book in hand, iPad at the ready, then you can count on the Eastern Shore as a terrific place. I can guarantee no bumper to bumper traffic, horns blaring, no overcrowded sidewalks, no blankets 2 feet in every direction from yours on the beach. 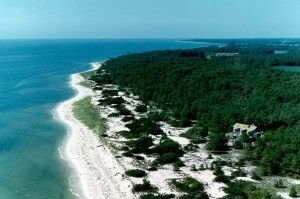 Just a beautiful, relaxing area, little historic towns to explore, sparkling low density beaches to enjoy, cool blue waters to swim, plenty of boat ramps and fishing piers to try out, miles and miles of coastline to kayak, our off-shore pristine Barrier Islands to explore, the freshest of succulent seafood to savor, Palmer and Nicklaus golf to keep you swinging, horseback riding through country trails to indulge your inner cowboy, an easy pad to launch a Williamsburg/Busch Gardens day trip from if the mood strikes, cute shops, terrific restaurants for fine or casual dining and friendly people. 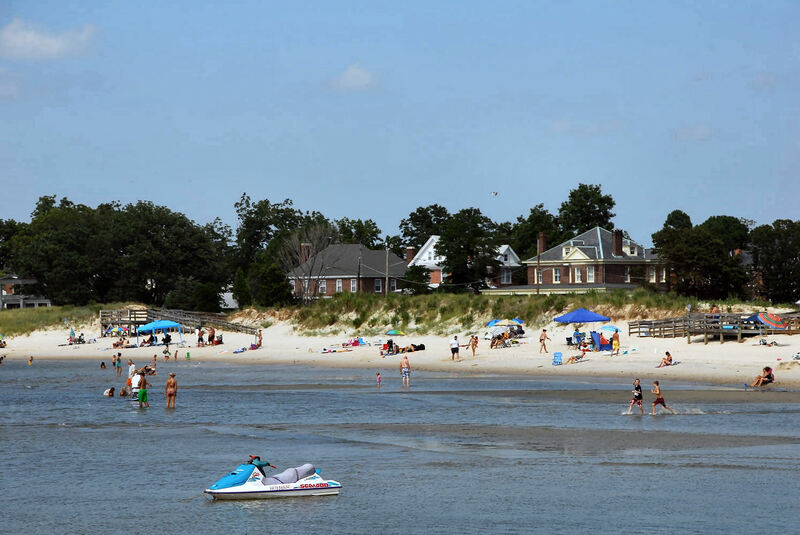 From A for “Antiquing” to Z for “Zesty clam dip”, you can have a memorable vacation on Virginia’s Eastern Shore, it’s Simply Relaxing The Shore Way. 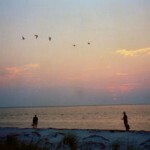 And I would be remiss if I didn’t give a shout out to 2 of the Blue Heron Realty Co. new vacation rental homes–– “Seahorse Retreat” and “Sun and Sand“. “Seahorse Retreat” is a charming, cozy nest for two, beautifully decorated in a — you guessed it, a seahorse motif. 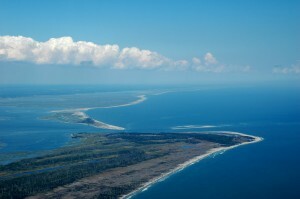 If you thought that when the Pilgrims first dipped their toes into the freezing waters of Cape Cod Bay in November, 1620 that they were the first group to contemplate serious colonization in the New World you would have overlooked the discovery in 1608 of Virginia’s Eastern Shore by Capt. 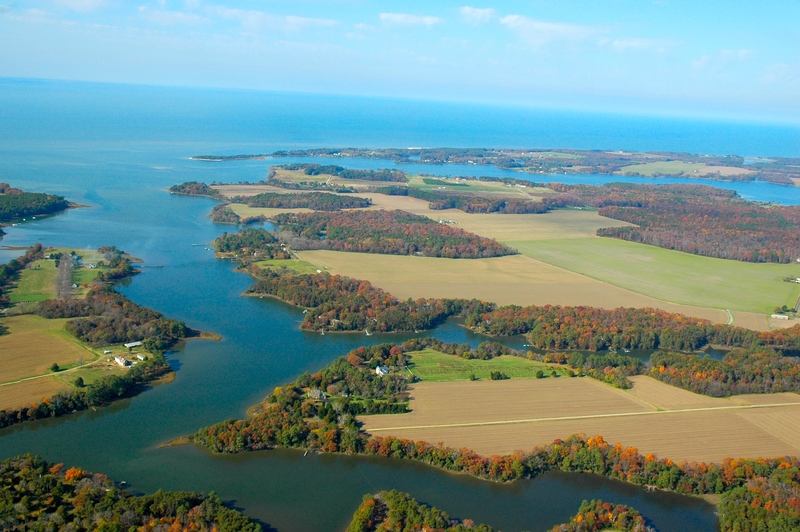 John Smith, of Pocahantus fame, as he sailed into the mouth of the mighty Chesapeake Bay, making the first of many commentaries about lifestyles on Virginia’s Eastern Shore when he said “Heaven and Earth never agreed better to frame a place for man’s habitation“. So although the Pilgrims got all the fame, fuss and memorialization ad infinitum via grade school Thanksgiving pagents, our little penninsula was the true spot where serious colonization got started, leaving aside the Lost Colony. 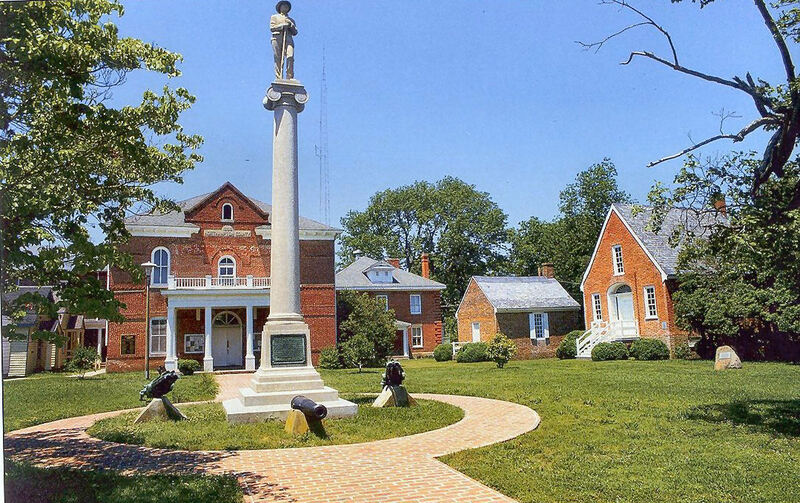 And the spot where it all started was here on the Eastern Shore of Virginia, in Northampton County, in what is now known as the little town of Eastville, VA. Eastville became the official county seat in 1690 when what is now called the old courthouse was built there. Today, Eastville is nationally famous in historical circles as being the oldest repository of continuous court records in the US and folks come from all over to study the old wills, deeds, etc. Eastville now is a quaint, tiny town centered around the Courthouse Green. The town is very much as it was more than a hundred plus years ago when many of the existing homes were built. 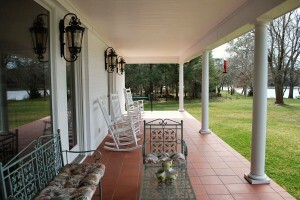 Tree lined streets and beautiful old homes with wide front porches set a relaxed tone. 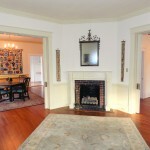 One of these gorgeous, elegant old homes is now for sale, listed by Blue Heron Realty Co. agent Gerry Forbes. 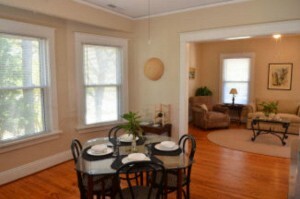 Built in 1917, this 5 bedroom, 4 bath historic home is in simply beautiful condition throughout. 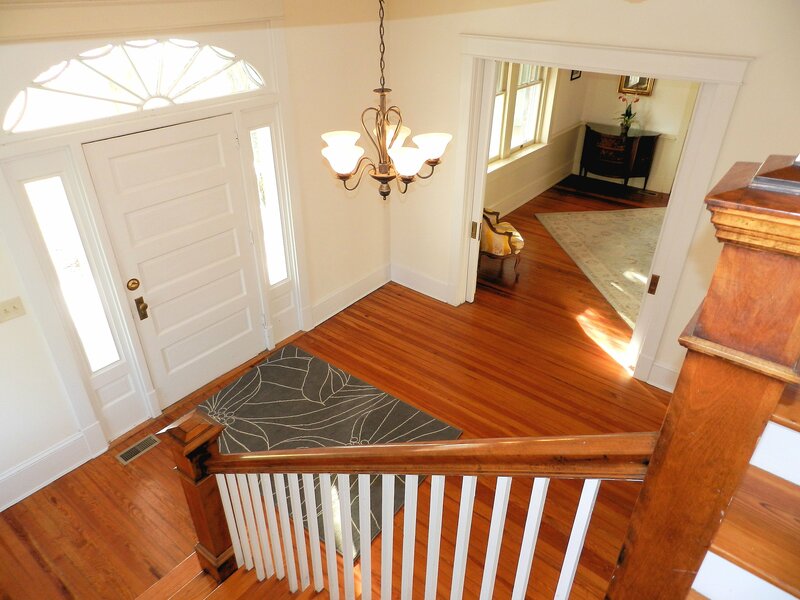 Gorgeous, gleaming hardwood floors, original of course, and Bfine moldings show off the excellent craftsmanship of this fine brick home. 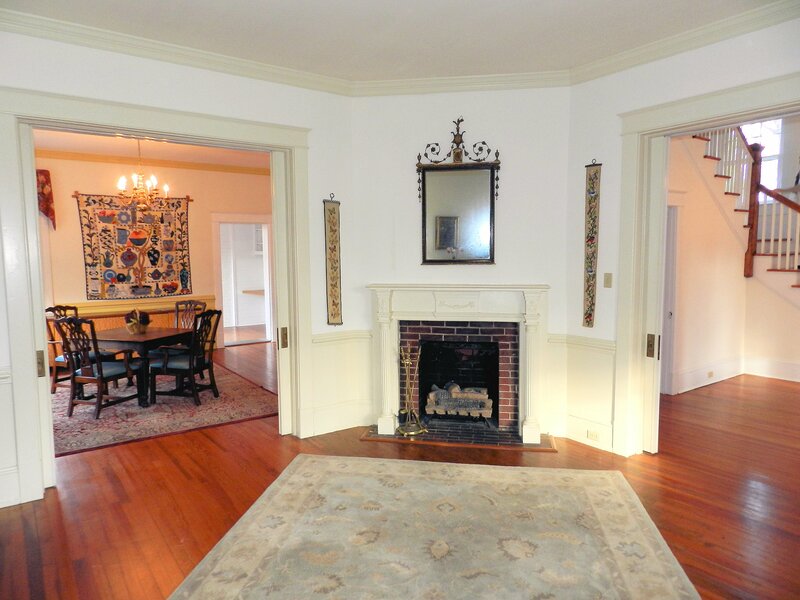 The formal living room and the formal dining room both have fireplaces adorned with charming old mantels and fabulous pocket doors. Lovingly updated keeping in mind retaining the historical integrity, this home now has updated plumbing and electrical service, like-new heat pumps and central air conditioning. The very spacious kitchen sports new glass front cabinets, trash compactor and a gas downdraft cooktop, everything at the ready to cook a five course meal at the drop of a hat. 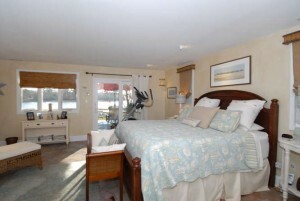 For anyone thinkling about opening a B & B, the third floor guest suite makes this home a great candidate for a B & B, especially as the third floor would offer a lot of private space for the owner. On the Eastern Shore, lovely Virginia waterfront homes near the Chesapeake Bay are not unusual but many of those homes are of a traditional style and the majority of them are two story, albeit many with total living on the first floor. 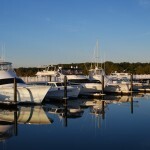 But for the growing number of folks looking for a waterfront home in Virginia who are absolutely set on acquiring a single story home, this new listing could be just perfect. One of the features important to many of our clients when looking for a waterfront home is being able to open the front door and say “wow” as they look from the foyer, across the living area and are immediately treated to a glorious view of the water– this home gets a ten- out- of- ten on that score ! 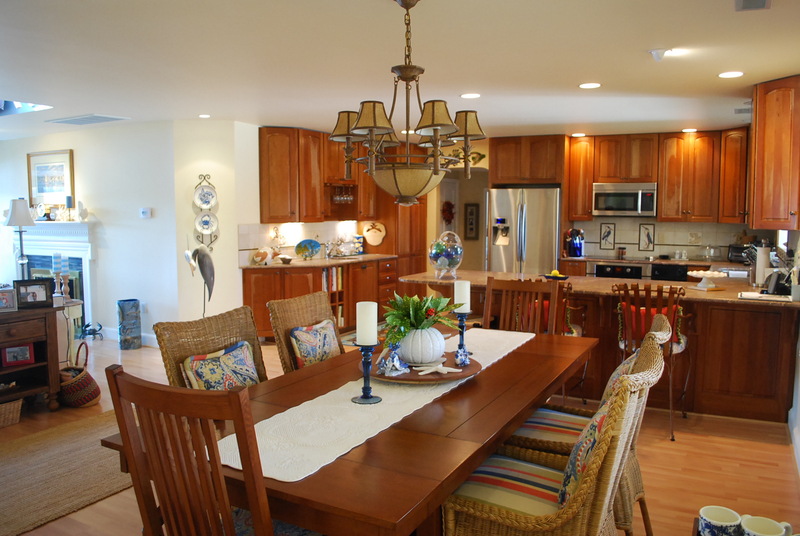 A few years ago, this lovely 3 bedroom, 3 bath home was renovated with three goals in mind– 1) opening up the floor plan to have larger, light-filled rooms and 2) creating water and nature views from every possible angle and 3) adding an additional, more spacious master bedroom suite. Definite success on every goal ! Walls of windows frame scenes of the sparkling blue waters, several new sets of sliding glass doors facilitate an easy flow between the indoors and the outdoors and the spacious new master suite also offers more privacy as it is located on the opposite side of the home from the guest bedrooms. During renovation, the kitchen, highlighted by custom cabinets and granite countertops, and dining room were opened up and combined into the living room. 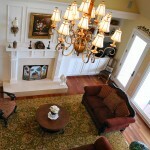 The resulting great room is simply spectacular ! A large skylight centered in the main living area was added, offering defused natural light which spreads throughout the entire great room. 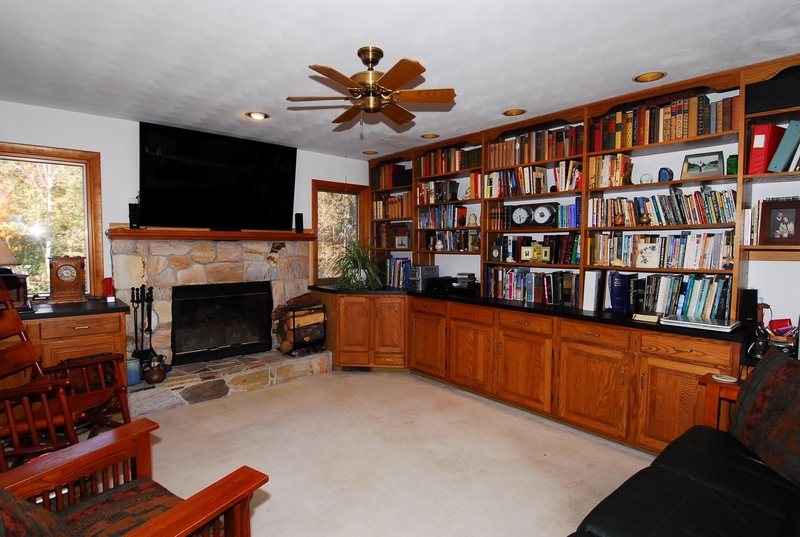 The fireplace adds additional cheer. 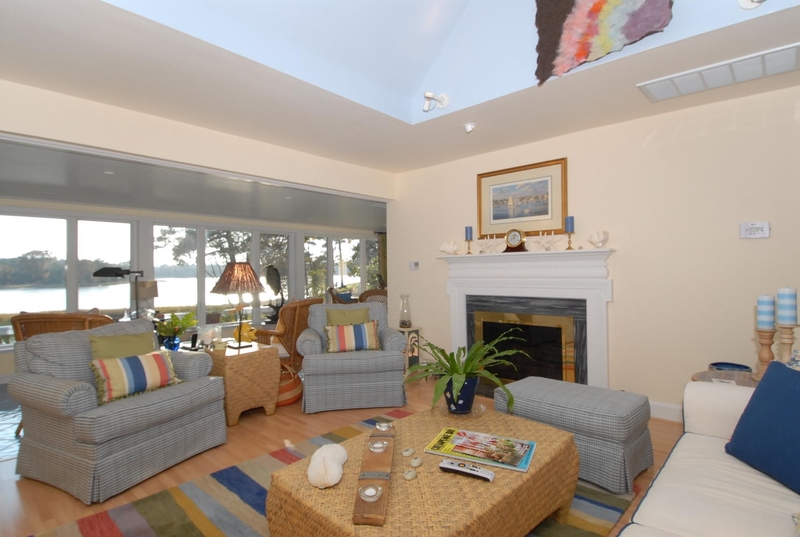 Hardwood in the great room transitions seamlessly to custom terracotta tile in the sunroom. Outside, lots of great nooks for entertaining a group or just a best friend. 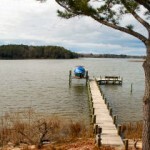 Located on a gentle knoll overlooking a colorful saltwater inlet from the Chesapeake Bay, one of my fav outdoor spots on this property is a little landing on the path down to the dock and boathouse. 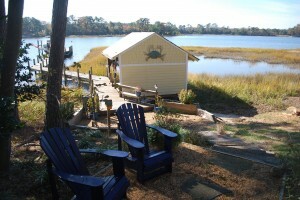 It’s a tiny landing, just big enough for two Adirondack chairs. But it’s so close to the water and offers such a tranquil feeling that you want to just sit and relax in those chairs forever ! 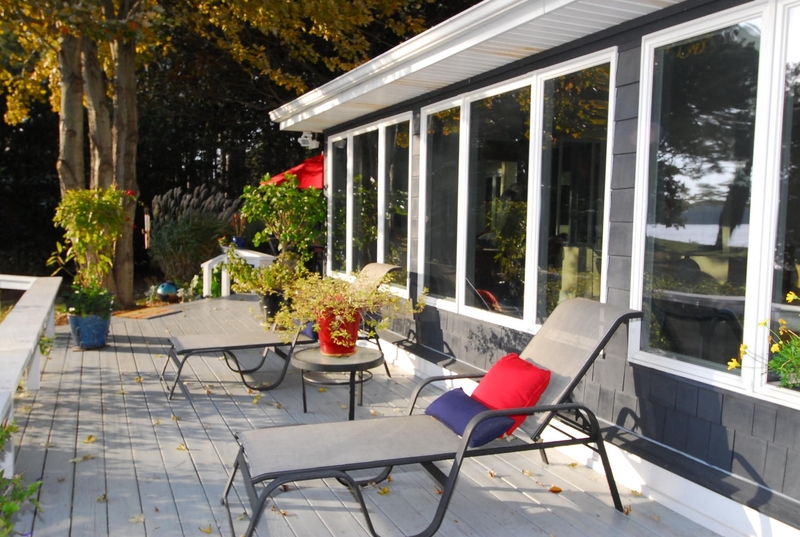 In addition to this little landing, there is also a attractive flagstone patio and full-house length deck with a cozy separate little portion of deck which wraps around to the new master suite. So— lots of places to enjoy the outdoors which is great because our very mild climate allows for lots of outdoor activities during most of the year. Lots of mature landscaping and bird-friendly shrubs attract a variety of songbirds year-round and of course blue heron and other wading birds stroll the shoreline, keeping a sharp eye out for a quick fishy snack. For boaters, a dock with large boat lift. 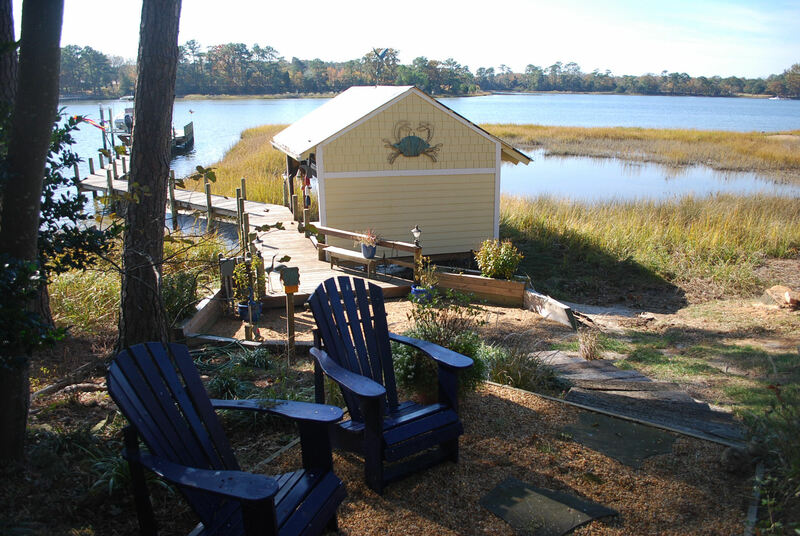 The boathouse, which is a rarity here, offers plenty of kayak storage for that tremendously popular sport, both facilitate easy access to the Chesapeake Bay which is literally just around the corner. 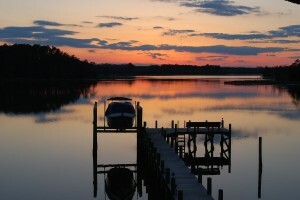 And for those who love fishing, a real fishing hot spot dubbed “The Cell” is quite close by. 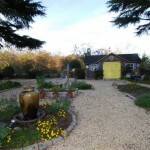 For gardeners, a large garden area with lots of colorful plantings, a veggie bed, birdhouses galore and a cute potting shed is enclosed by a white picket fence, a real oasis of natural serenity. 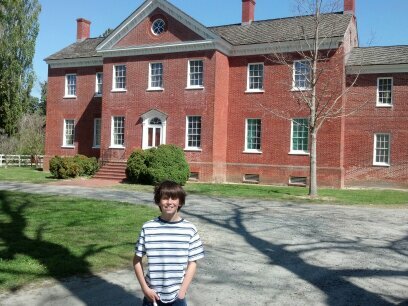 My grandson Charlie Morgan attended a week of history camp at Ker Place, the headquarters of the Eastern Shore of Virginia Historical Society. Presented by the Eastern Shore of Virginia Historical Society, http://www.kerplace.org the seventy attendees at the historic Ker Place Museum in Onancock, Virginia had the opportunity to tour spectacular Eastern Shore historic homes, enjoy a gourmet dinner in an early 18th century home and gather the wisdom of eight nationally acclaimed experts on diverse subjects related to the historical theme of this symposium. Friday, the first day of the symposium, was dedicated to touring five of Virginia Eastern Shore’s very special Chesapeake Bay area homes, both historic and new, to see the many different ways that folks live a modern life with history. Emphasis was placed on architectural features and their preservation and restoration, the interior design components that showcase their owners’ lifestyles and the landscaping that enhances the exterior features of the homes and environment. After a full day of lectures from the experts on Saturday, the attendees were treated to dinner at Vaux Hall (cir. 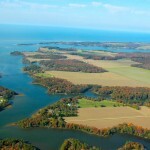 1710) located on Warehouse Creek, a colorful saltwater inlet from the Chesapeake Bay, only a few miles outside the historic town of Onancock. 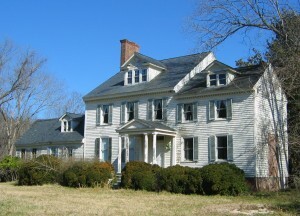 This early Georgian colonial home is believed to be the oldest two-story residence on the Eastern Shore and features beautifully preserved wood paneling, moldings, doors and heart-pine floors. On Sunday, the program finished with three more lectures of very special interest. To see a full program of this wonderfully educational event go to http://www.kerplace.org/symposium.pdf . 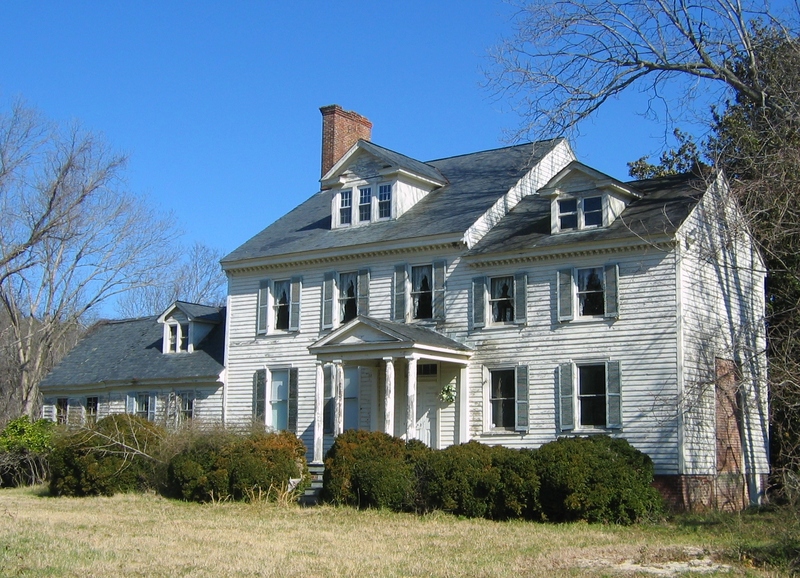 The Eastern Shore of Virginia has many properties with 17th and 18th century homes, some with accessory buildings that date as far back as the 1670’s, and many more homes dating from the 19th and early 20th century. With such a rich collection of historic homes in our relatively small geographical area, a peninsula which is literally surrounded by water, it is indeed fortunate that we have a historical society so dedicated towards education and appreciation of our heritage. Anyone who loves the Eastern Shore, residents and visitors alike, should not pass up the opportunity to tour the amazing Ker Place Museum in Onancock, headquarters of the Eastern Shore Historical Society. "Prospect Hill" cir. 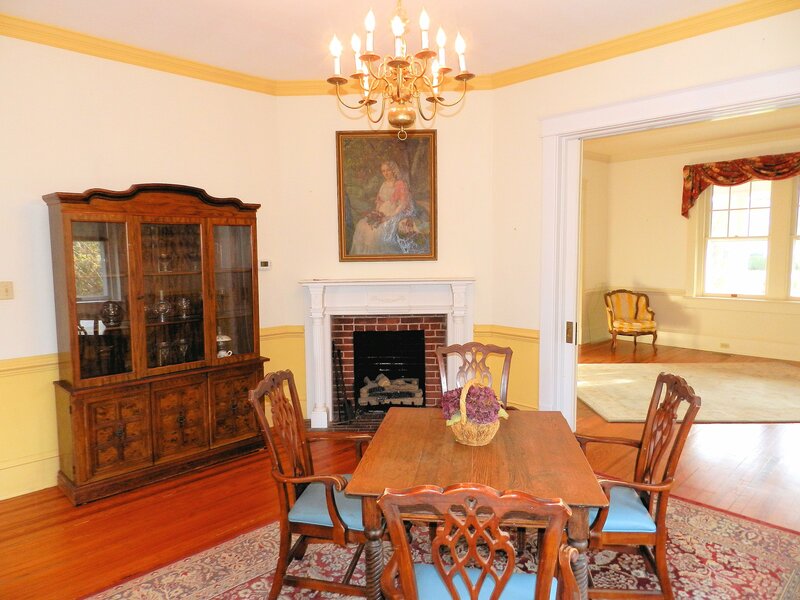 1790 awaits a new owner who will love and cherish her wonderful, charming heritage. The first lecture I attended was a talk by Matthew Webster, the Director of Historic Architectural Resources of the Colonial Williamsburg Foundation. He emphasized methods for indentifying the signs that reveal the architectural history of old buildings, a subject that interested me hugely. He spoke about examining the wood framing for saw marks, checking the joinery of posts and beams, looking for different layers of paint, identifying the fastenings of the structure such as nails, dating the types of windows, and determining the type and bonds of brick masonry. 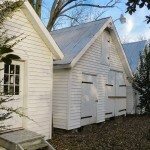 Also, he gave a study of different types of houses according to the time period of their construction which would be exemplified by certain styles of architecture such as Georgian 1720-1780, Federal 1780-1820 and Greek Revival 1820-1850. Accompanying his lecture with projected photographs, he distinctly pointed out the different characteristics of which he spoke. The second lecture was given by Chris Ohrstrom, a founder and co-owner of Adelphi Paper Hangings, LLC. They specialize in reproducing antique wall papers and he gave a wonderful illustrated talk about their special process that revives the old tools and craftsmanship of the industry from the 18th and 19th centuries. I was mesmerized by the old techniques, his descriptions of their factories and tooling, and the examples of wallpapers his firm manufactures. I learned that wallpapers were meant to be only a shortlived wallcovering that imitated much more expensive wall decorations. On Sunday, I was glad to hear the talk given by Ken Farmer, well-known antiques appraiser from the PBS series “Antiques Roadshow”, who has been collecting and selling the finest antiques from his shops in Radford and Charlottesville, Virginia. The gist of his remarks centered around the theme of “antiques are the epitomy of green – recycling”, informing his audience about how to find, evaluate, and purchase antiques. I learned that oftentimes one can purchase better quality used furniture while avoiding the higher cost of good quality reproductions that have a lower value. The second lecture that Sunday was given by Jeffrey Price, the director of Sales and Marketing for Virginia Lime Works. His company specializes in reproducing mortars for the restoration of aged masonry construction, especially from the 18th and 19th centuries. His slide show presentation demonstrated the old techniques for making lime as well as how old handmade bricks can be damaged by the use of modern mortars, a risk that never occurred to me when I have examined restored colonial brickwork. The final lecture was the most entertaining, given by Paul “Chip” Callaway, a certified landscape architect/owner of Calloway and Associates. His hilarious commentary that accompanied a voluminous slide show of his special projects, those restoring the gardens and landscape of historic buildings, kept the mood of his audience light, focused and amazed. 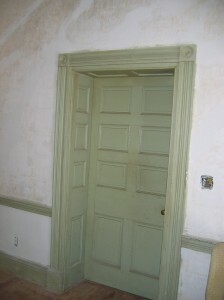 Handmade doors with mortise and tennon joinery open from the through passage to the living room in the earliest part of the home. 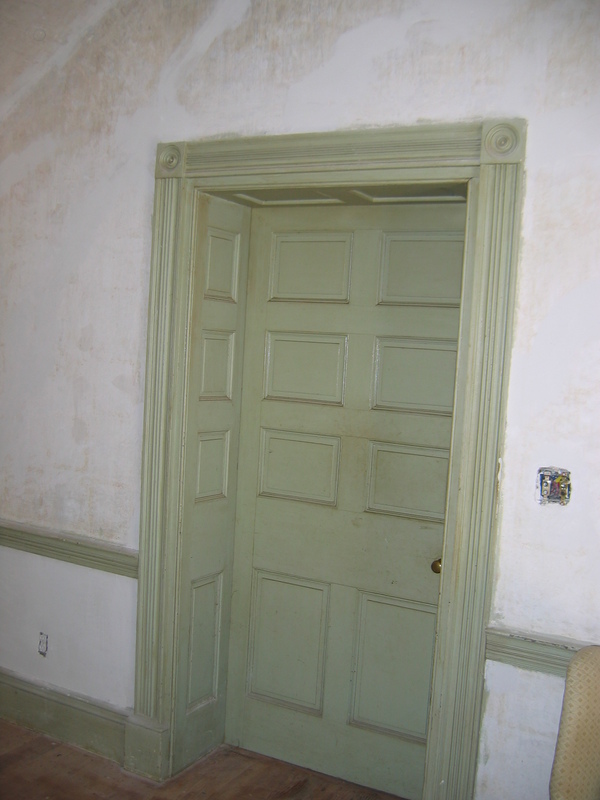 Note the deep, paneled recess of the doorway, indicating a former exterior wall. Now fortified with this interesting knowledge base gained from my attendance at the symposium, I again visited my listing “Prospect Hill” located on Seaside Rd. 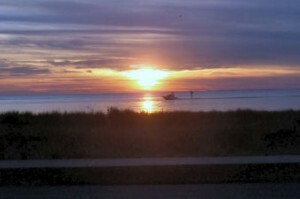 approximately 22 miles north of the Chesapeake Bay Bridge-Tunnel. I had previously guessed that the first section of the home was of Federal design and construction around the period of 1790-1810, the second, larger and more ornate addition in a Greek Revival tradition dated around 1830 and the third section, a one and one-half story addition containing the kitchen, was of the 1890’s period. Upon my next visit to the property, I used the tips from the symposium to confirm or deny my original assessments. First, up in the attic area and down in the basement, I examined the exposed beams and joinery for sawmarks and fasteners. Second, I studied the great wall of bricks and exposed chimneys for telltale signs of handmade bricks, like thumb and finger impressions. Third, I then closely examined the windows and glass. My post-symposium investigation revealed that the home was constructed with oversized handhewn, heart of pine beams with diagonal but straight sawmarks and plenty of mortice and tennon joinery. Also, I found square cut nails with machine cut heads, both indicating the first section was probably produced shortly after 1790. This part of the house was finished with interior wood paneling, fireplace mantel and cabinets distinctly styled from the Federal period, (cir. 1780-1820). 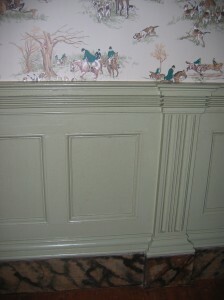 In the Greek Revival addition, handcarved wood panel wainscoting with marbellized baseboards - note fluted columns in panelling. The second part, a larger more ornate addition was finished with elaborately decorated woodwork, especially the very fancy, intricately hand-carved fireplace mantels. Further, the marbellized paintwork on the baseboards and the fluted doorway surrounds confirmed the style of the Greek Revival period (cir. 1820-1850). This addition has a massive 3-brick thick, free-standing three story brick endwall laid in the Flemish bond pattern. The top three feet of the exposed chimney had been blasted by lightening and I found on the ground plenty of bricks with thick slabs of mortar. Close examination of the bricks revealed holes and thumbprints, indicating that these were handmade sometime prior to 1833. 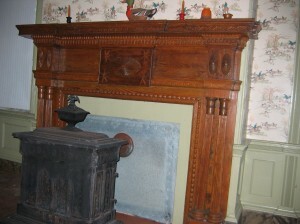 One of three massive handcarved fireplace mantels of museum quality - note the marbelized paint on the baseboard below the wood panel wainscoting. Lastly, off to the east of the home is an overgrown boxwood garden of formal design interspersed with crepe myrtle and one of the few cork trees on the Eastern Shore of Virginia. The size of the boxwoods indicates an age of well over one hundred years and the garden certainly begs for restoration and rejuvenation. The 1890's kitchen addition - note the floor-to-ceiling cupboard and tin ceiling. 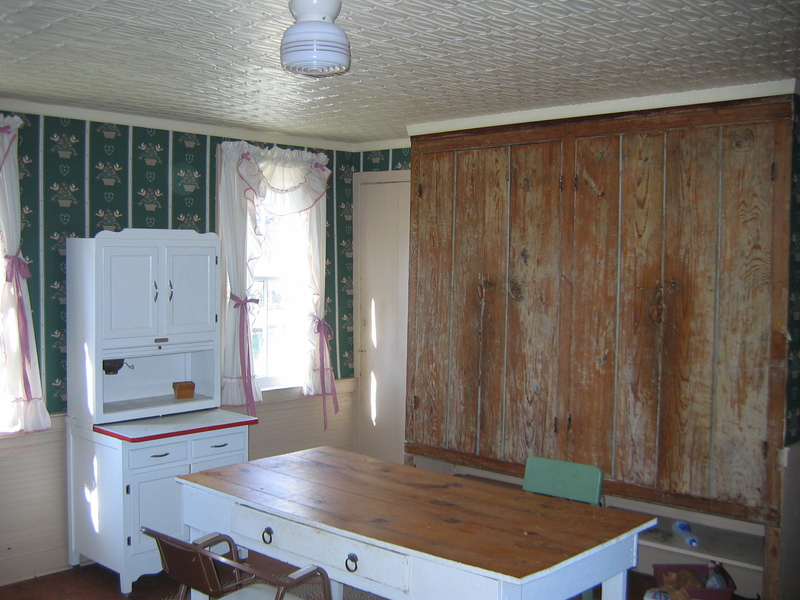 As the listing agent, I have become very attached to this old house and her museum quality architectural features. 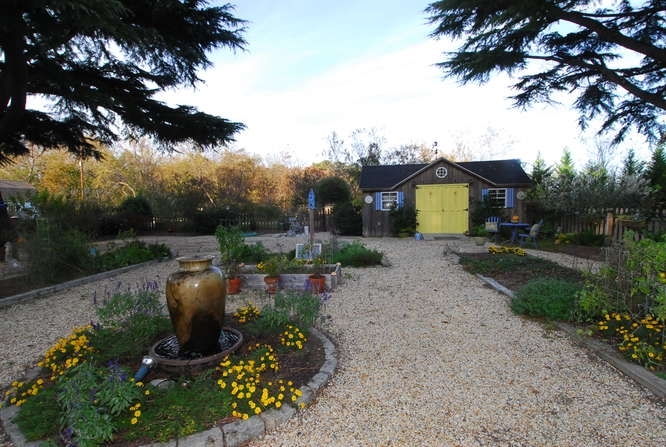 Her situation on a sixty acre farm of fields and forest is ideal for a country estate property and a lovely 3/8 mile driveway approach draws one’s imagination back to the days of self-sufficiency and fox hunts. 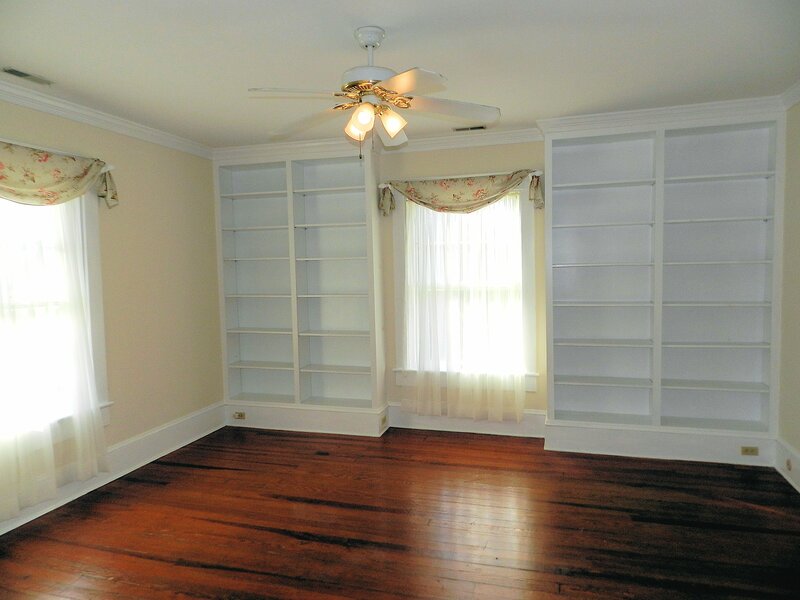 Many generations and all their attendant celebrations have graced this property and she now awaits a new owner who will love and cherish her spacious, well-appointed rooms that, if walls could speak, could tell many stories. 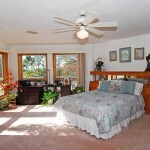 For even more information on this home, call David Kabler at Blue Heron Realty Co., 757-331-4885 . 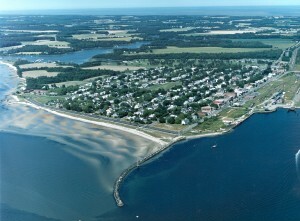 Cape Charles, VA., The Little Town that Could! And Did ! 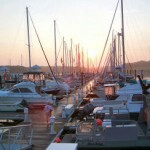 A recent article in the paper brought back fond memories of last June 8-12, 2012 when the little Town of Cape Charles, Virginia on Virginia’s Eastern Shore hosted a big fleet of ships in its tiny deep-water harbor in celebration of the Bicentennial of the War of 1812 and the birth of the Star Spangled Banner. Attracted by this wonderfully varied armada, hundreds of thousands of visitors came from far and near to see this historic gathering of tall sailing ships from around the world, OpSail 2012, sailed into the Port of Hampton Roads, Virginia. In concert with the cities of Norfolk, Virginia Beach, Chesapeake, Portsmouth and Hampton VA, the people of Northampton County and the Towns of Eastville and Cape Charles had spent the better part of a year planning their celebrations of these historic events. These amazing tall sailing ships began arriving in the lower part of the Chesapeake Bay a week early and the new Cape Charles harbor marina was included in the event, hosting the visits of three sailing ships – schooners Lynx, Appledore III, and Sultana – as well as the US Navy patrol craft Zephyr, and a harbor full of pleasure and commercial watercraft. Against the backdrop of Cape Charles downtown mini-skyline, the harbor full of these schooners presented a beautiful site for a festival of the first magnitude. Planning for the event in Cape Charles called for the coordination of nearly every element of our community, private, business and public. Our own David Kabler from the Cape Charles office of Blue Heron Realty Co. had envisioned for many years the welcoming of tall sailing ships into the Harbor of Refuge in Cape Charles. This bicentennial celebration offered him the perfect opportunity to demonstrate to the Eastern Shore community the power of tall ships in stimulating our economy. 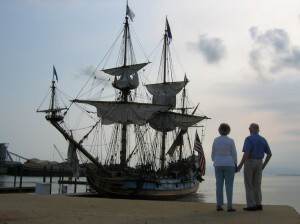 Beginning in February of 2011, David presented to the county government leaders and the leading economic powers of the Eastern Shore his Tall Ships Economic Development Initiative for the attraction of the tall ship industry. The first part of the plan called for our community’s participation in OpSail 2012 and afterwards an ongoing effort to attract tall ships throughout the year. Such an effort has proven to stimulate an host locality’s economy, tourism, education, community organization and infrastructure improvements, and during OpSail 2012 the Eastern Shore was no exception to this rule. The plan was readily adopted and publicly funded, setting into motion an organization of our community’s assets like we have never seen before. queen of the tall ship fleet. 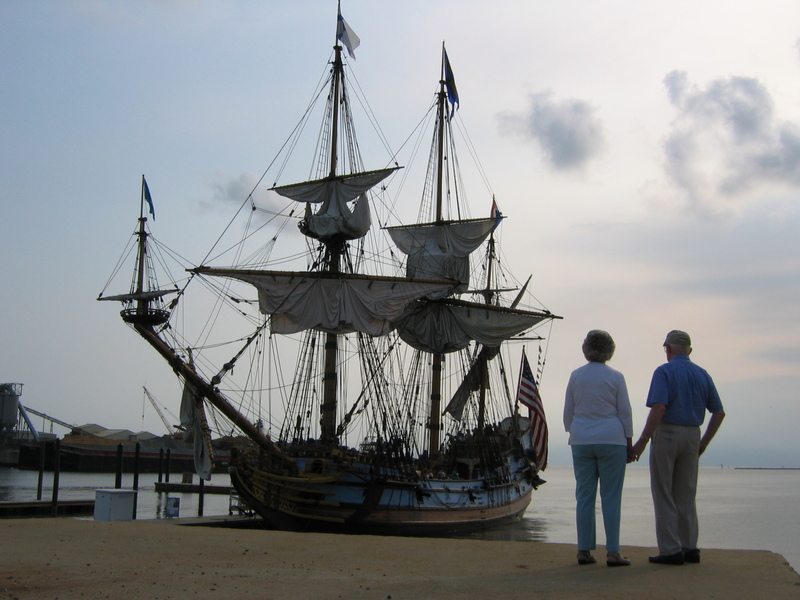 She hails from Wilmington, DE, and is a replica of the 17th century Dutch trading ship that brought the first Swedish settlers to the area of Cape Henlopen, DE. 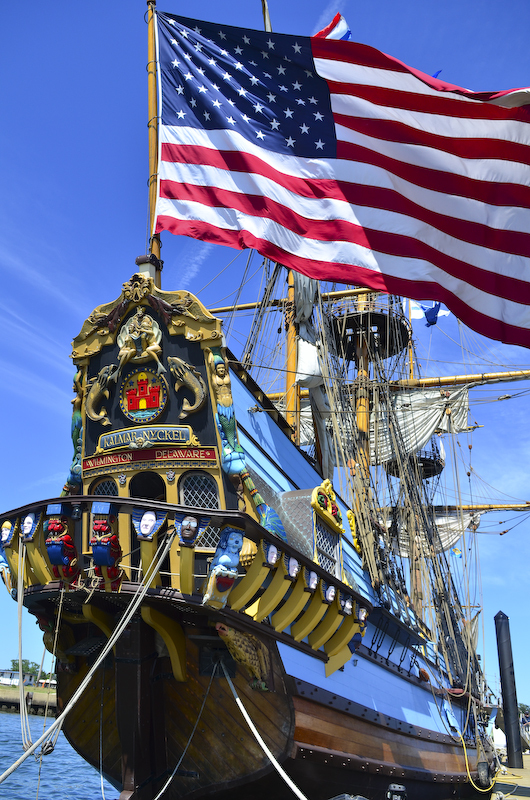 The arrival of Kalmar Nyckel to the town harbor heralded the beginning of a remarkable weeklong visit that brought thousands of school children, tourists, and Eastern Shore residents to town. They toured the ship, learning about 17th century transportation technology and nautical life and even taking sail charters aboard her out into the Chesapeake Bay. Government and business leaders throughout the County attended the ship that weekend to see first hand how remarkable such a ship is and how attractive she is to people of all ages and walks of life. To complement her visit, an anonymous donor generously sponsored the attendance of Queen Elizabeth I’s court, Historic Interpretations from Raleigh NC, replete with five Elizabethan tents populated by an entire troop of actors dressed in beautiful period costumes. Children came to the queen’s tent to be knighted, activities of the 16th century were re-enacted, demonstrations of dance, games, food, and armour of the period were performed, all set up in the new park in the center of town, appropriately called now Central Park. After the excitement of the visit of Kalmar Nyckel died down, serious planning took hold for our community’s participation in OpSail 2012. More than thirty people, representing town and county governmental departments, local business organizations, and volunteers, began meeting monthly to organize what promised to be the largest festival ever held in Cape Charles. Funding from Northampton County and the Town of Cape Charles provided seed money for grant applications that, together with generous private and commercial sponsorships, supported the wonderful concepts that made the Cape Charles Tall Ship Festival so special. 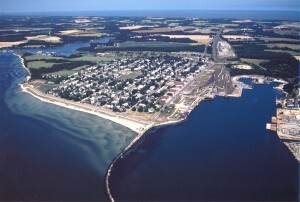 The Chesapeake Bay Bridge-Tunnel offered organizers the use of the second island for public viewing of the spectacle of the Parade of Sail of the international fleet of tall sailing ships. The Bay Coast Railroad lent the use of their historic railyards for accomodating the many vendors and Historic Interpretations’ Elizabethan village. 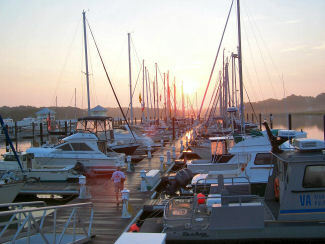 Cape Charles Town harbor generously offered the tall ships dockage at its brand new marina facility of floating piers. 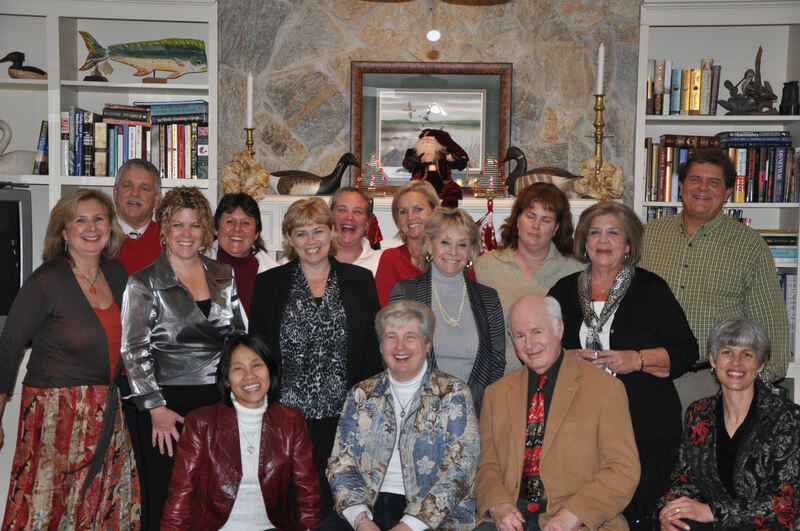 All of the schools of Northampton County participated in the Adopt-a-Ship program hosting the ships’ crews when they arrived at receptions and special events in their honor. Staging was erected for live music bands and food vendors of all sorts set up shop next to the docks. Hundreds of volunteers were organized by the Cape Charles Rotary for parking, transportation and maning of the information centers around town. 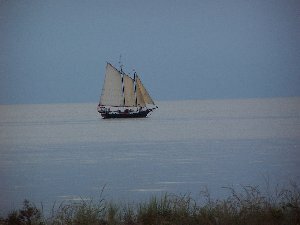 It is estimated that ten thousand people came to the four day event called Tall Ships at Cape Charles! You can imagine what kind of economic impact such attendance generates in a county of only about 13,000, in a town of around 1,000. 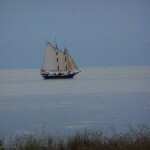 Lasting impressions about our town, our county and our community were carried far and wide by the many visitors who left amazed by the wonderful scene of tall ships sailing in and out of the Cape Charles harbor. Months of public relations work generated huge interest in our event. Advertising on the highways, in printed publications and on the internet in websites and social media contributed untold benefits. All this together works long and hard towards establishing an identity for our community that will carry us forward for increased tourism, higher education, community cohesiveness and future improvements to the Eastern Shore of Virginia in general. 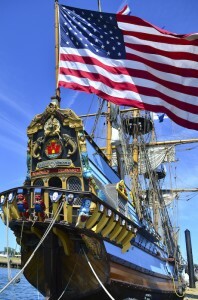 Now, due to the success of our participation in OpSail 2012, Northampton County has again funded the effort to attract the tall ship industry in their 2012-13 budget planning! 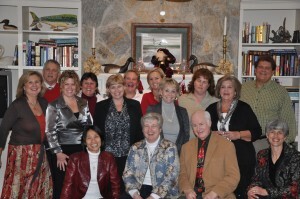 And Blue Heron Realty is proud to say that we were the driving force behind the whole kit and caboodle! 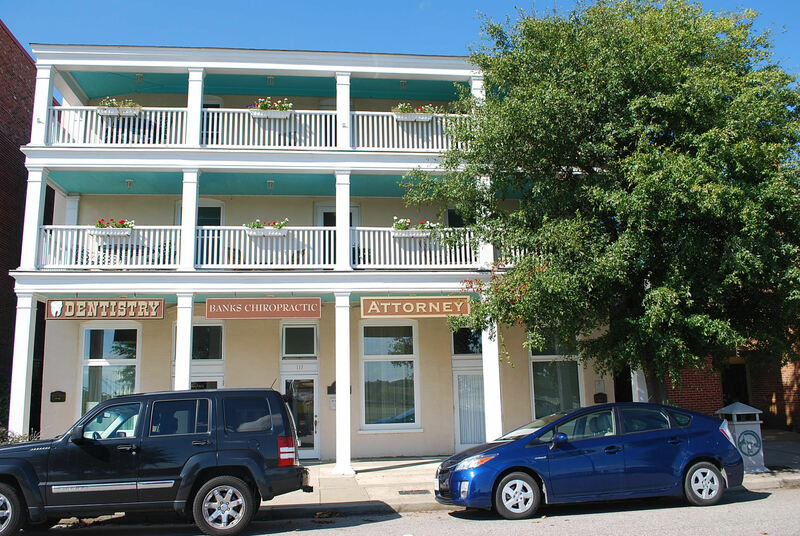 In the heart of the little coastal town of Cape Charles, VA lies its charming Commercial Historic District. The original buildings generally date back to the early 1900’s and most have been fully renovated, ready to do yeoman’s service for another 100 years… at least ! And on the prime western end of the Mason Avenue’s Commercial Historic District, Blue Heron Realty Co. has three beautifully designed commercial space condos for sale, ranging in size from 1100 to 1500 sq. ft. 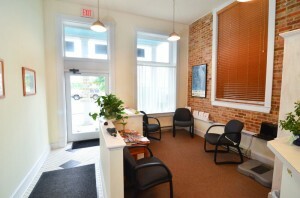 Absolutely perfect for a multitude of commercial uses, from virtually any type of office office to most retail uses, these three spaces are very attractively priced, ranging from $120,000 to $150,000. 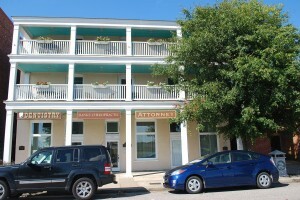 Each condo offers excellent street visibility and signage as well as one of the best locations in downtown Cape Charles, only 2 blocks to the beach. If you already own a small business or are thinking of starting a business, you may wonder if owning your office or shop space instead of renting it offers many benefits. My personal opinion is a resounding Yes! The first and most important is that owning gives you greater control and stability for your business which results in better control over your own destiny. Assuming that you have confidence in your business, there is a great deal of security in owning rather than renting your business space. No more big rent hikes ! No need to worry about the possibility of an announcement that the landlord is selling the building and suddenly the terms or even the actual renewal of your lease is in question. And you are not paying off someone else’s mortgage, you are building up equity for yourself so at the end of the day if you sell, your money comes back to you instead of your landlord. Appreciation in value is important as is the ability to be able to also sell your physical premises should you decide to sell your business which might be very beneficial to the deal. 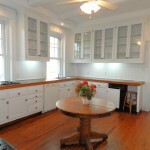 And any renovations you do over time accrue fully to your benefit, not to the landlord’s. All three of these commercial units are on the ground floor of an attractive three story mixed-use brick building constructed in 1901. 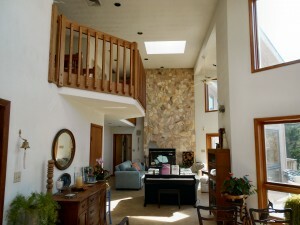 The building’s second floor consists of 2 large residential condos, the 3rd floor boasts a 3000 + sq. 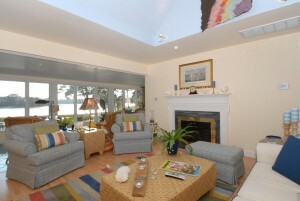 ft. penthouse with a double veranda overlooking the town and its colorful harbor. All three commercial units are currently in use as office space. the 1100 sq. ft. units are professional offices– a dentist and a chiropractor, each of whom rotate between multiple offices, practicing one or two days per week in Cape Charles. Each unit is currently configured with a reception area, several office or treatment rooms and a bathroom so clearly easy to convert to other types of office use or even retail if desired. 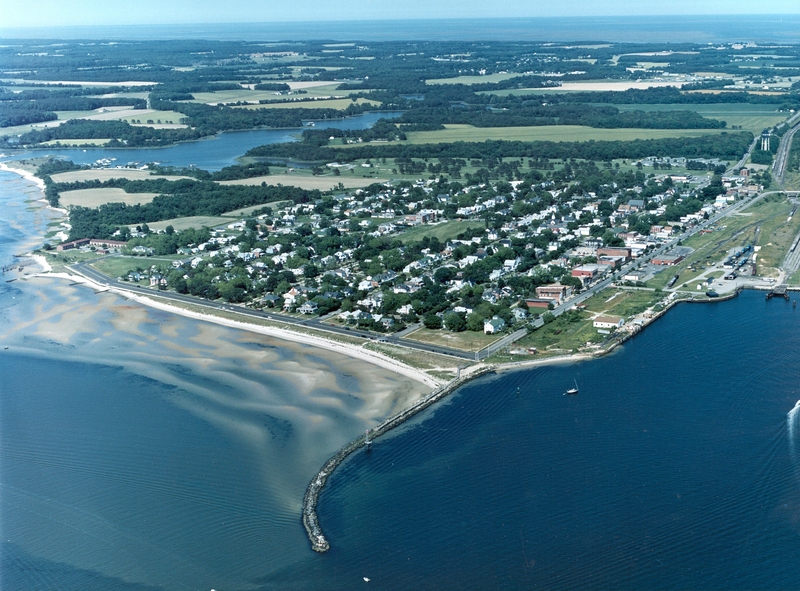 And it would be hard to beat the small town ambiance of Cape Charles if you are looking to open a business in a friendly coastal area. 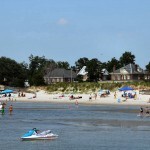 In fact, the June, 2012 issue of Southern Living Magazine named Cape Charles as one of its “Best Little Beach Towns“, quite an honor. As it’s just a short walk to the beach from these condos, a quick stroll on the boardwalk would be great for keeping the waistline trim. 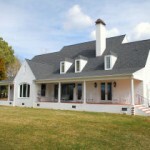 Drop in at the beautiful Cape Charles Coffeehouse for a quick cup of coffee on the way to the office. ( The Coffeehouse also has a great lunch menu, with one of the best chicken salad sandwiches ever. And for dessert, don’t miss Roberta’s luscious coconut cake with cream cheese icing and lemon custard filling. Absolutely delectable, unbeatable this side of the moon ! ) Or walk just a half block to Kelly’s Pub for lunch, home of a lip-smacking good char- broiled burger accompanied by the best dill pickles, straight from New York City. Or try Rayfield’s Pharmacy’s honest-to-goodness old- fashioned soda fountain lunch counter featuring, among other items, a really delicious BLT, overstuffed with plenty of B and nice ripe T. And yes, of course, they do have milkshakes, sundaes, and ice cream sodas, chocolate’s the best ! Banking ? Walk to the credit union just two blocks away. Odds and ends ? If the hardware store doesn’t have it, just don’t you worry, they’ll order it. Need a bottle of wine for dinner ? Stop in at Gull Hammock on the way home, where by the way, each Friday they have a new shipment of Prize’s homemade bread, sinfully good, especially the cinnomon raisin sourdough. Want to take a client to a fine dinner ? 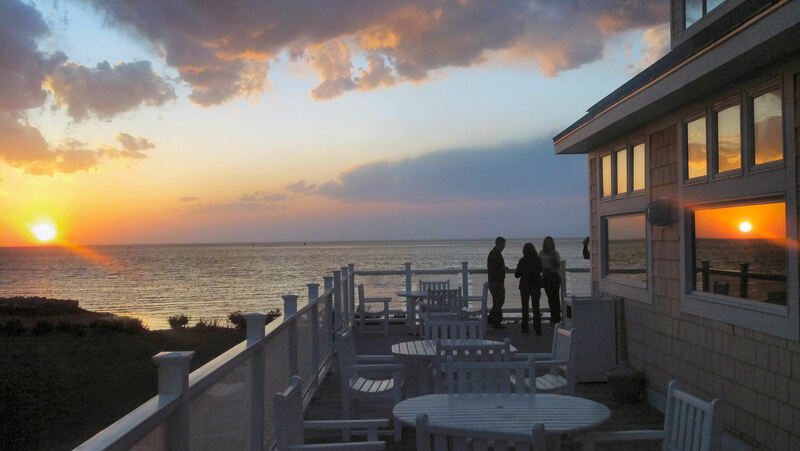 Five minutes away you’ll find Aqua Restaurant overlooking the Chesapeake Bay, home to excellent food in a beautiful setting. Need some decor ideas ? Try your nearby neighbors at Best Nest, 209 Gallery or Stage Door Gallery. 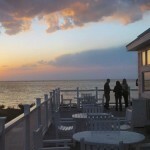 The point being that within Cape Charles’ quaint Historic District, instead of having to let your fingers do the walking, you can have the pleasure of getting out and about, among your friends, neighbors and fellow business owners, doing errands and business the old-fashioned way–person to person. 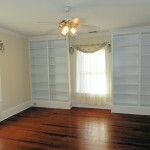 For more information on buying your own business condo, call Blue Heron Realty Co., 757-678-5200 or 757-331-4885. 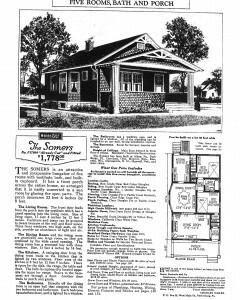 Through the years Sears maintained a selection of some eighty house plans that were updated to keep abreast of developing trends and for the sake of variety. The plans ran from the smallest sized bungalow to a number of truly substantial models including the elaborate “Magnolia”, which for about $5.000, offered ” Eight rooms and two and a half baths. 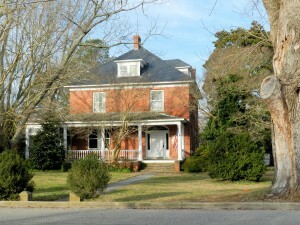 Two story portico with fluted columns; open terrace across the front, side porte-cochere; decks and sleeping porch off second floor bedrooms; glazed front porch with sidelights and arched transom. 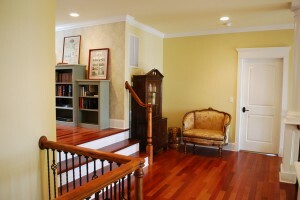 Fireplace and nook in living room; French doors off hall; open stairs” . But, in general, the majority of their designs were in keeping with the popular American tastes of the period and were designed to have broad appeal by offering a quality modern home for an affordable price. 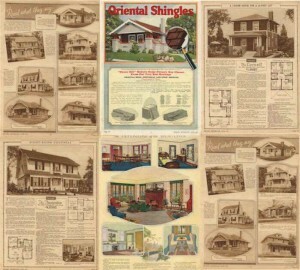 For extra flexibility, most home plans in their catalogs were able to be ordered in reverse layouts. 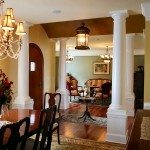 The styles of the homes seem to almost always follow recognizable architectural traditions. 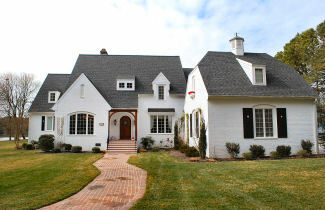 The gambrel roof was a mainstay of the Dutch Colonial style. Roofs with steep pitches evoked English ancestry. The most popular style though, by far, was the well-liked American Colonial, rivaled only by the “bungalow” concept. The building of houses in America prior to World War II reached its peak in 1925, but Sears home offerings would continue to expand through 1929, the year of the great crash of the stock market. By 1930, across the nation, Sears had opened 48 sales offices employing over 350 salesmen. 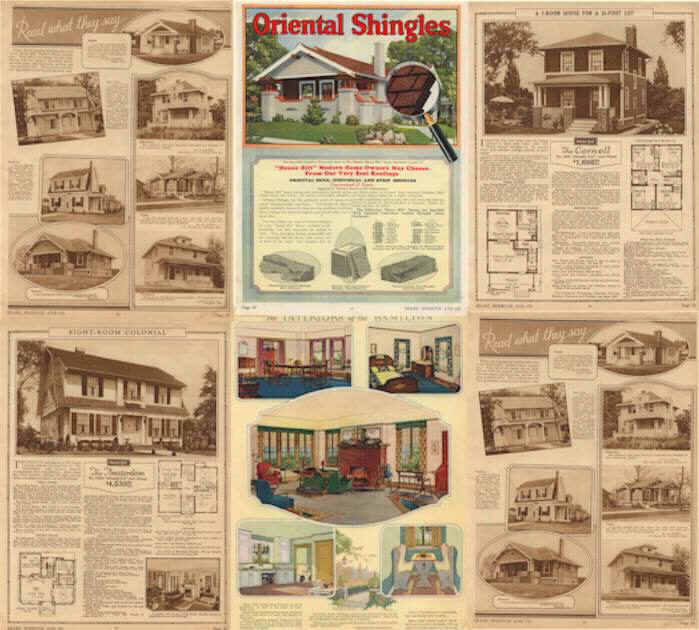 Their 1926 catalog was a masterful marketing piece, presenting their products in color and with exceptionally glowing remarks about the product attributes. Even the type of wood used in the construction of the homes was referenced because of the interest created by the then recent discovery of well-preserved cypress found in King Tut’s tomb. 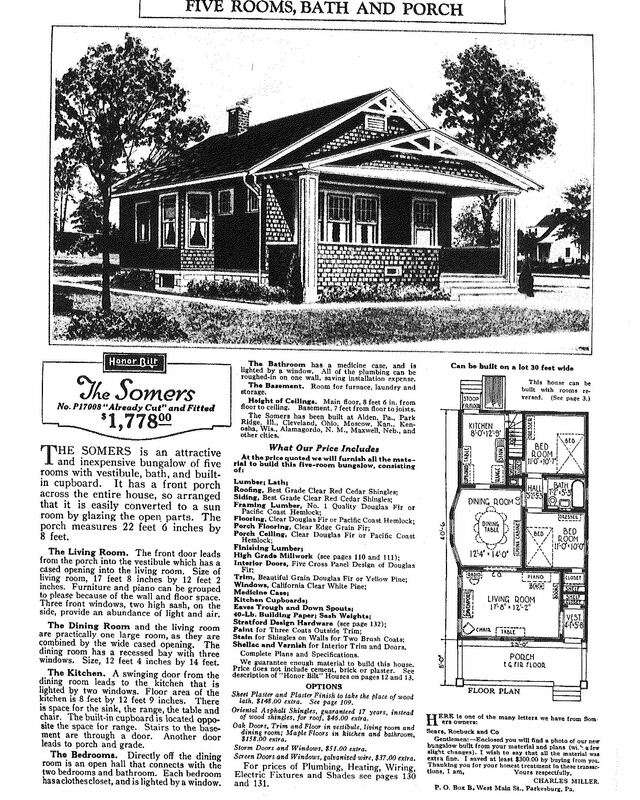 The Sears Modern Home catalog descriptions addressed every concern imaginable, from the basic reasons for buying a home to touting the then unusual and innovative step of the company’s placement of a woman on the Sears Architect’s Council because she “would understand the needs of the modern housewife.” Nobody imagined that this incredible line of prefabricated housing would last only eight more years. The 1930’s brought the first losses after nineteen consecutive years of profitability. No matter what great ideas Sears employed in supporting its line, the effects of the Great Depression could not be overcome. The first division to fail was the home mortgage industry where, as the “farmer’s friend”, Sears had loaned generous amounts of up to 100% of the cost of a home’s construction. But by 1934, Sears had proudly delivered more than 100,000 housing units throughout the United States, very high quality homes, professionally designed and planned for a lifetime of use by their owners. 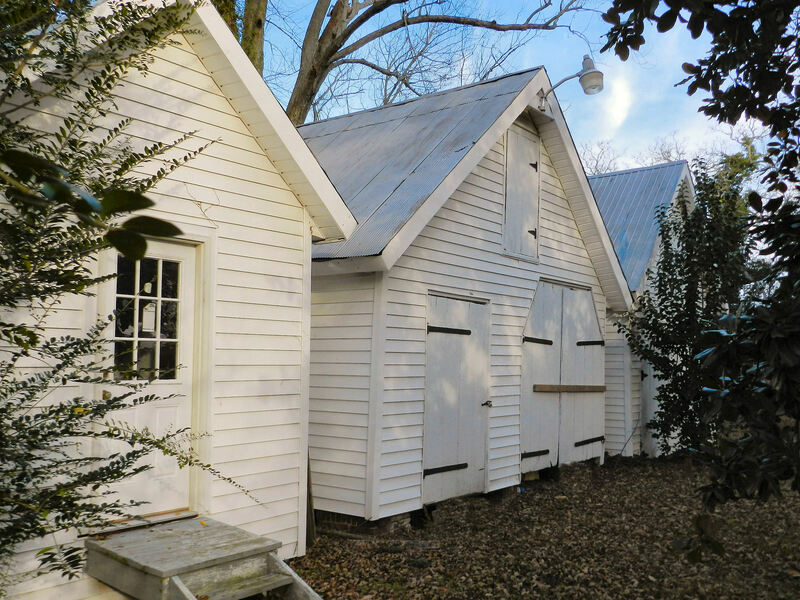 The Town of Cape Charles on Virginia’s Eastern Shore has a number of authentic Sears homes, most restored and well-preserved. 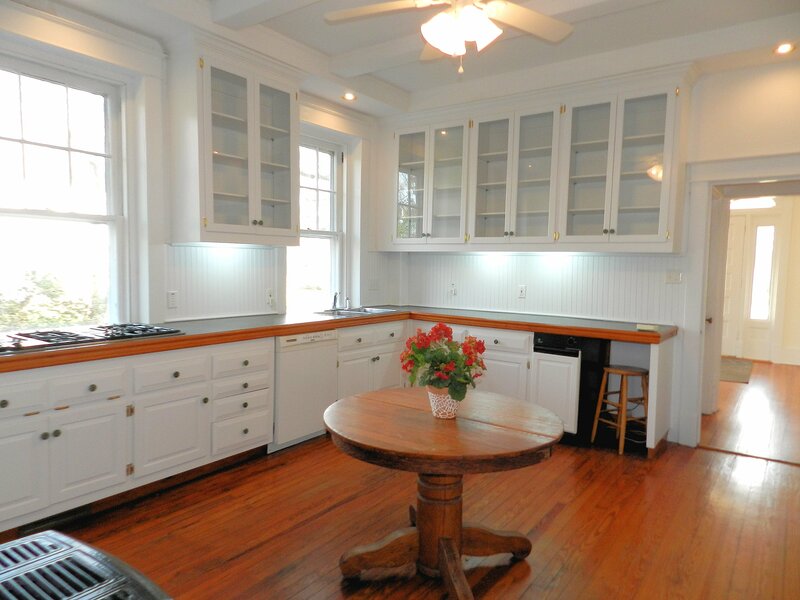 For sale by Blue Heron Realty Co. is a reverse plan of the Somers Model ordered from the 1926 catalog and found at 3 Randolph Ave., just a hop, skip and a jump from the Chesapeake Bay and the beautiful Cape Charles town beach. Professionally restored and renovated for modern living, this home is a terrific example of the very popular Sears bungalow style. 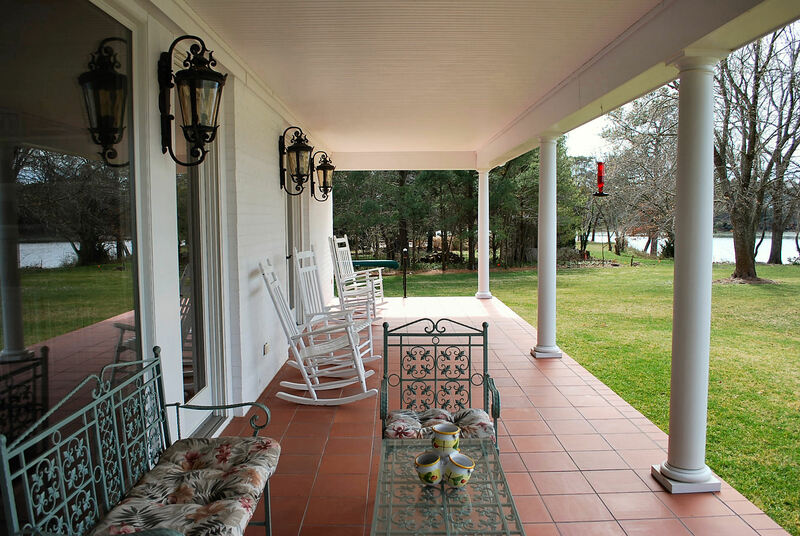 Elevated well above eight feet from grade level, this front porch enjoys a wonderful view out towards the western horizon of the Bay. The ground floor of the home consists of a solid masonry, red-brick foundation for the actual kit home which makes up the second level. The kit home has beautiful cedar wood shingle siding protected with a weather-proof stain that retains the wood grain and color. Also, energy efficient, double pane insulated windows have been installed. Built on two town residential lots, there is a paved driveway, spacious yard with mature plantings, and an access alley behind the home that serves for utility and service access. Inside, one is suitably impressed by the beautifully refinished original red oak and pine hardwood floors, a bay window in the dining room, a modern kitchen and two bedrooms served by one bath. 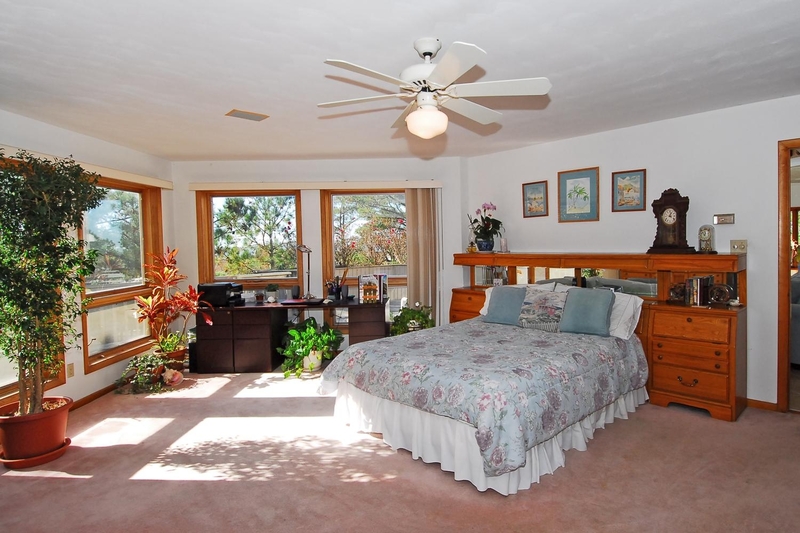 A heat pump supplies central forced air heat and A/C for the upstairs portion of the house, while beautiful ceiling fans provide the comfort of moving air. 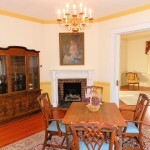 The entire home has been updated and renovated for modern living yet retains its historic appeal. 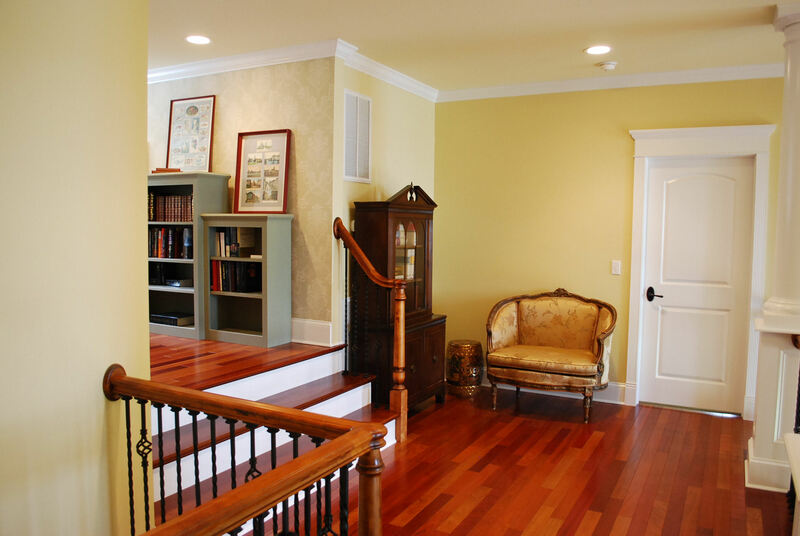 A stairwell leads down from the second floor to a first floor apartment with its own kitchen, great room, two bedrooms, a bath and storage area. 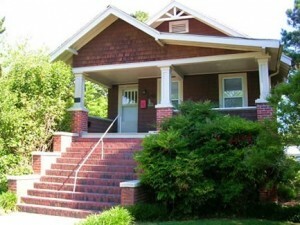 One may retain the official duplex status of the home or restore it back to a single family house. 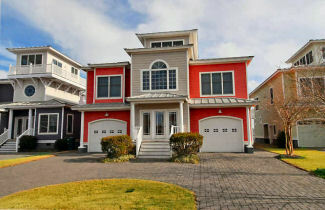 At present, the upper level which comprises the kit home is offered for weekly summer vacation rental while the lower floor is rented from month to month. Life in the Town of Cape Charles is truly the “sweet beach life ” ! 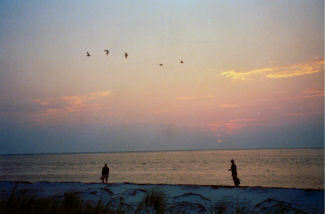 One of the few places on the East Coast of the United States where one can observe a beautiful sunset to the west over a saltwater Bay. 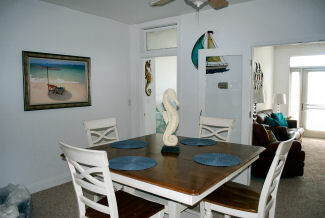 Easily accessible from this bungalow is the boardwalk and “fun pier” from which observations of boats, kite board surfers and the local bird life are frequently found. 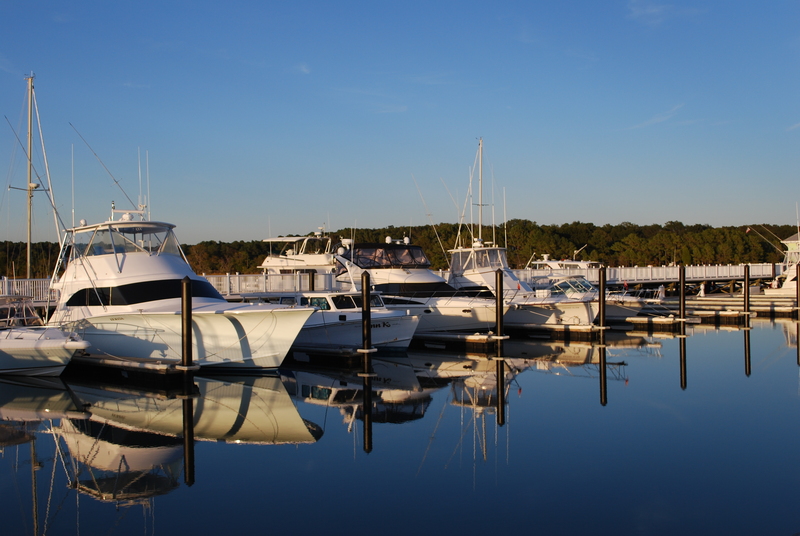 Nearby are the public boat ramps and municipal and private marinas, world-class, intersecting Palmer and Nicholas designed golf courses, eclectic shopping and restaurants, and our very special historic Palace Theater, one of the best performing arts venues in Virginia. 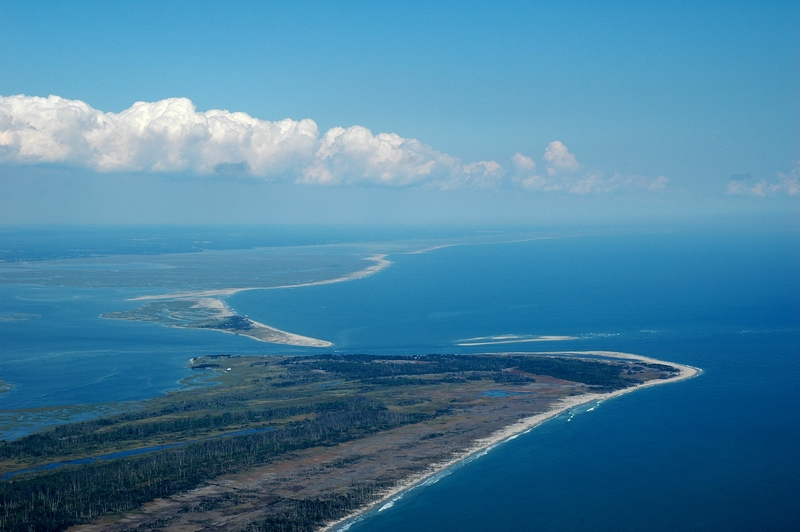 Only a few miles east of Town is the village of Oyster which is perched on the seaside of our penninsula and offers access to an entirely different marine ecosystem. 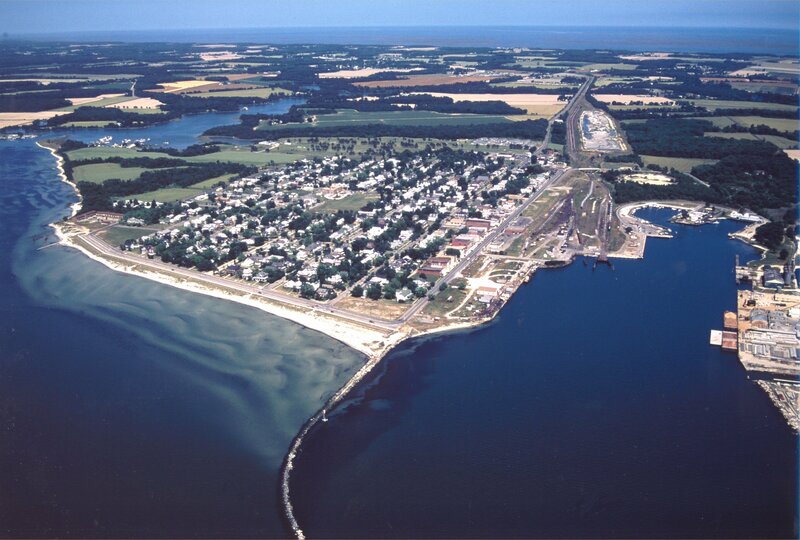 Interests in colonial history, the performing and visual arts, nature exploration and photography, boating and fishing, architecture, gardening, bicycling, hiking, swimming, and especially birdwatching are eagerly pursued here. Come and try on this incredible lifestyle offered from such a wonderful residence as this historic Sears and Roebuck Catalog home. For further information on this listing and other properties for sale in Cape Charles and on the Eastern Shore of Virginia, contact David Kabler via e-mail ( david_kabler@hotmail.com) or via mobile (757) 647-1755.